San Juan is the capital and largest city in Puerto Rico. As of the 2000 census, the city's population was 433,733. 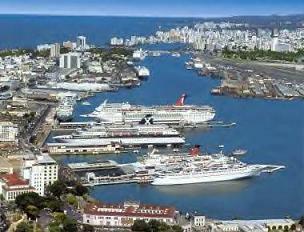 San Juan is home to the Commonwealth of Puerto Rico's most important sea port, San Juan Port. This port handles approximately 90% of Puerto Rico's ship-based passenger and cargo traffic, and is a popular stop in Caribbean cruise tours - visited by over 1 million cruise passengers each year. San Juan is also famous for the Old San Juan district. This is a historic neighborhood which is filled with colorful buildings and narrow cobbled streets, and which was built during the Spanish era in the 16th and 17th centuries. Old San Juan is in fact on an island, and is connected to the mainland of Puerto Rico by bridges and a causeway. Important education institutions in San Juan include the Ana G. Méndez University System's Metropolitan University (main campus), the Polytechnic University of Puerto Rico, the University of Puerto Rico (main campus) and the University of the Sacred Heart. Major airports for San Juan include Fernando Ribas Dominicci Airport and Luis Muñoz Marín International Airport.